When you play Swampqueen Hagatha, you discover two spells to place on the 5/5 token minion. The token minion gains the text: "Battlecry: Cast (SPELL 1) and (SPELL 2)"
Super fun card. Can't wait to play this one. Wow, this is kind of crazy with shudderwock potential lol, I wonder what sort of shaman we can come to expect in 2019? Looks super Strong, i like it! Seems pretty good - good that they made it possible to target with the chosen spells. fun,strong and a lot of value I LOVE IT! Cool that Shudder will both copy the effect of the Horror you played and also add a new one with random spells to your hand. This might be a little slow, but that's a fun effect. I like this a lot because of Shudderwock. Obviously, a 7-mana 5/5 with no immediate board impact is very bad. But being able to play the effect twice, as well as the Horror's effect twice, and generate another horror, is damn good. Shaman still kind of has the issue of "what am I doing with all this incremental value?" Maybe the metagame will change enough such that this is actually a viable strategy. ...that said, if it does become a viable strategy, you're going to be very hard pressed to find a deck that does it better than Shaman. And we've seen that metagame before. As the classes move away from infinite value, Hagatha (Hero) and Shudderwock are really close to that. This is bonkers.. I’m so glad they’ve moved away from infinite value and toward more stuff like this. From what I understood the first spell pool always includes targetable spells while the second spell pool includes non-targetable spells, to allow you to select the target for the first one. Crazy highroll potential but also a strategic card. Will definitely see play. it gives even more support to shuderwock, hagatha decks. But if the meta is agressive 7 mama 5/5 with no direct effect on the board can be too weak. 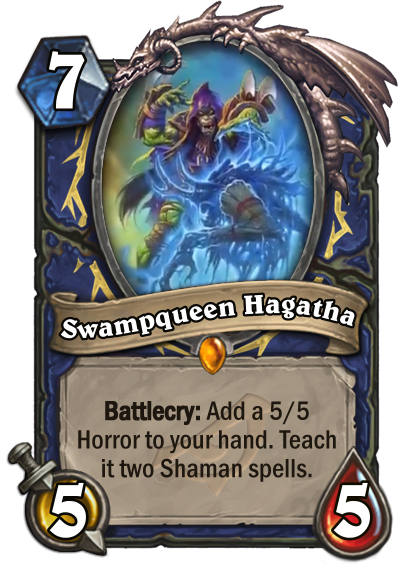 Hagatha, Shudderwock, Electra, Zentimo, Krag'wa and this new Hagatha. Shaman is getting so many insane legendaries. It seems very good. Very good also because the targets of the spells are targetable and not random. I love the flavor and the uniqueness of the card. It is a bit slow but if Shaman gets a healing spell (or a good spell in general), I think Shaman can make a lot of value. Yes, but if don't get insanely good survival/stall tools all will be useless, maybe we don't get in this expansion and need to wait the next one. Tons of good cards for control are rotation out. I wonder if the spells will Overload as battlecries? Love it. Looks very fun yet powerful in a control deck, without being completely busted. I love Shaman, and especially Kalimos, so having a fun and flexible Battlecry on a new legendary just keeps it top of the FunMeta for me! Deffo preordering now, hope this is my golden legendary! I like the card art and effect.